Have you decided to get a taser to help protect yourself or a family member? If you are looking for the best taser to buy, you aren’t alone. We decided to research and review all of the highest-rated, best tasers we could find. Then we compiled a list of our top ten favorites and reviewed all of them for you! While looking for the best and brightest, we found a few stats that helped us to pick out the most useful tasers for us. So we’ve included each of these stats for each of the top ten taser. Here is a brief explanation of each. Volts - Volts is how tasers’ power is measured. The more volts, the more powerful the taser is. Most tasers hit at around 50,000 volts. Battery Life - How long does the battery in your taser last? Know how often you’ll have to charge your taser; always make sure to keep it charged. Flashlight - Does the taser have a flashlight built in? It’s a great way to ensure that you have some light with you, should the worst happen. Charger - Does your taser include a charger? If not, we’ll let you know how to go about getting a charger for your taser in the right size. Dimensions - Since tasers are supposed to be portable, make sure that the taser will fit in your pocket, bag, or wherever you plan to keep it. Warranty - Warranties cover manufacturing defects and protect you from getting a bad item. We’ll let you know how long you’re covered. Now that we’ve covered the stats, we’re just about ready for the reviews! Although we love all of these products, there were two that stood out from the pack. The first is our Top Pick, which was our favorite of all ten. The second is Budget Pick, which is a great taser for a low price. If you’re in a hurry, make sure to take a look at those two first. Now let’s get to those best taser reviews! Our Top Pick is the Vipertek VTS-989! This powerful stun gun is great for protection. Not only does it deliver a big shock to anyone you touch with it, it also has an anti-snatching mechanism built in that will shock anyone who tries to pull it out of your hands. It’s a small size and fits in pockets and purses with ease. The ultra-sharp spikes help to push through even thick clothing to get at the attacker underneath. The handle has a no-slip grip on it to keep it in your hands. The Vipertek VTS-989 also comes with a safety LED flashlight to help you in other emergencies. And, the rechargeable battery only needs to be charged about once a month if you don’t use it! So if you want reliable protection, check out the Vipertek VTS-989. The Terminator Stun Gun is one of the most powerful tasers we’ve ever seen. 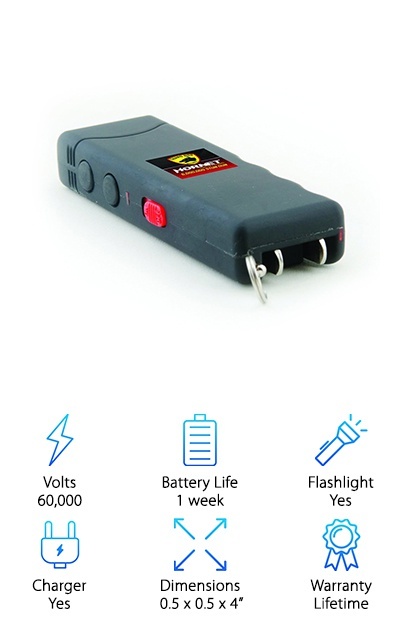 This stun gun is ready to take out anyone who is trying to attack you or your loved ones. It has a lifetime warranty guaranteeing that your taser will work just as expected. It plugs right into the wall with fold-away prongs to make keeping it charged as easy as possible. 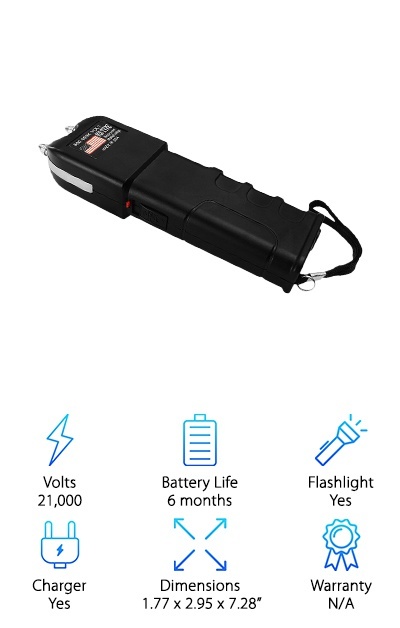 The Terminator Stun Gun also features a blinding LED light that can light up an emergency situation or be used to blind an attacker. It comes with a quality nylon holster, but can also be stored in your purse or pocket. 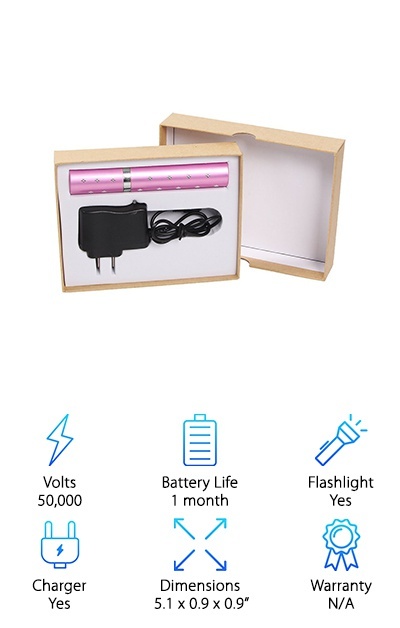 A single charge lasts you about 5 months! So if you are looking for powerful protection at an affordable price, check out the Terminator Stun Gun. We think that the StreetWise Ladies Choice is the best taser for women and here’s why: it’s small, inexpensive, built for women’s hands, and has a super loud alarm to cry for help for you. This stun gun is amazing; it is small and great for purses or pockets. It features a super bright LED light to help illuminate emergency situations. It has a built-in charger that can be charged at home. It has a safety pin to help keep you from accidentally setting your taser off or hurting yourself. And it has a wrist strap to help keep it in your hands and away from your attacker too. The StreetWise Ladies Choice comes with a holster that you can carry it in that is both durable and easy to use. Looking for a disguised, tiny stun gun that still packs a punch? The LetsFunny Mini Lipstick Stun Gun is smaller than most stun guns and doesn’t look anything like one. That can help to disguise your weapon, giving you the element of surprise against an attacker. It features an internal, rechargeable that comes with a charging cord for your convenience. It has a very bright LED flashlight for both light and defense. And the stun gun also makes some very loud, very frightening noises that will scare attackers and might get you help. All you need to do is touch your attacker with it. It works for humans and animals, too. 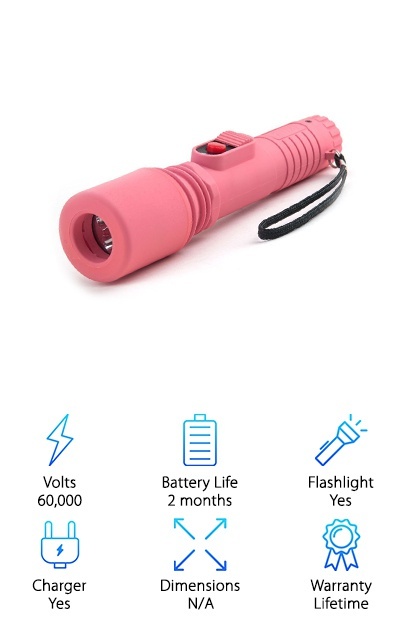 So if you are looking for a super small, hidden way to bring some protection with you while camping, walking, or driving, the LetsFunny Mini Lipstick Stun Gun is a great choice. 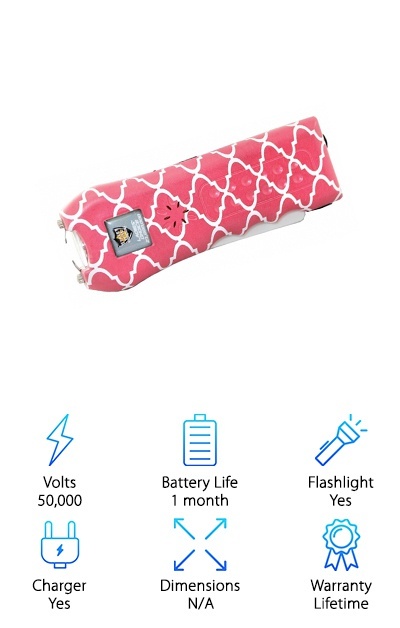 The Gahira Lu Stun Gun is a powerful stun gun with a battery that lasts for up to six months! 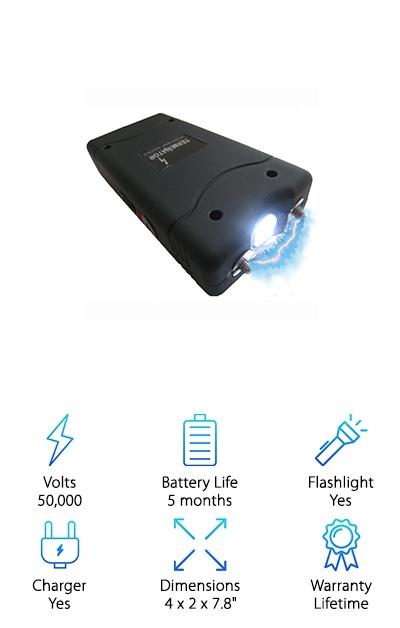 This stun gun has a powerful LED light that can help you to see or blind an attacker with a sudden bright light. The stun gun is smaller; it fits easily in a pocket or purse. 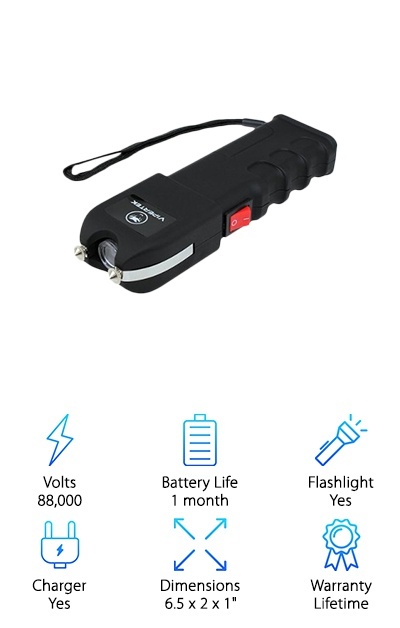 Although this stun gun is powerful, it still puts safety first; there is a lock button to prevent accidental use that could waste power or cause someone harm. This stun gun has been designed just like the tasers that are carried by law enforcement. 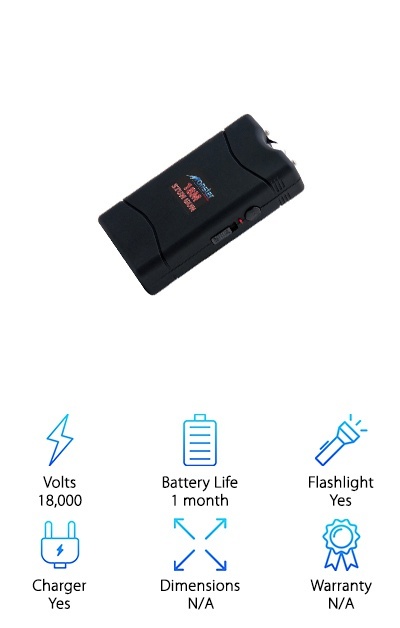 It’s very intimidating; once on, the stun gun has a bright electric current that makes a lot of noise; many potential threats will be chased off just at the sight of this stun gun turned on! The tiniest stun gun ever! This little tiny stun gun is small enough to put on your keyring. But don’t let the size fool you! The World’s Smallest Stun Gun is a powerful defense tool that really hits hard. It has a very powerful arch that can down just about anything that’s after you with just a touch. And it fits in your palm, making it easy to conceal. The World’s Smallest Stun Gun also has a built-in plug for easy charging. It weighs less than two ounces, making it so lightweight, it won’t weigh down your purse, pocket, or your keys. And the best part, it comes with a lifetime warranty. It’s a great gun, and the manufacturer has a lot of faith in it! And for good reason! 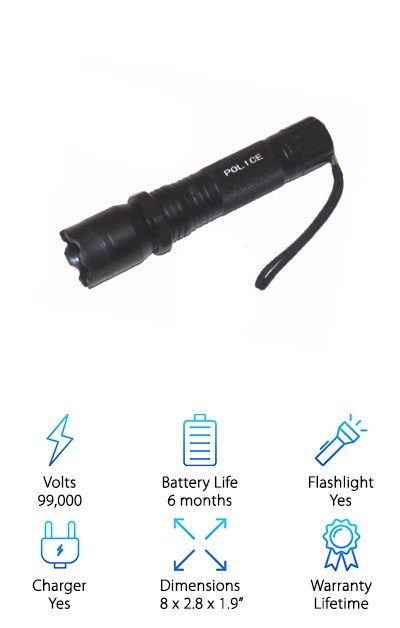 The Police 305 looks and feels like a flashlight, but it deals a zap like you wouldn’t believe! It has a lot of power for such a small device. It’s about 8 inches long, and it’s made of durable plastic that won’t quit. It comes with a convenient carrying case and wrist strap. The Police 305 is covered under a lifetime warranty. The rechargeable battery is easy to recharge; the fold-in plug can be plugged directly into the wall. And one of the best parts is how well this stun gun was thought out. It has a LED light built in for safety and light. It has an on and off switch that helps to prevent accidental discharge. It even doubles as a glass breaker to get in or out of bad situations. The Monster Stun Gun comes in a variety of colors and patterns! If you want your stun gun to match your stuff, this is a great gun for you! The sound of this stun gun is intense; it will scare off a lot of potential attackers all on its own. The built-in LED is really bright and very pointed, making it great for illuminating the darkness. It has an on and off button to keep the gun from accidental discharge that could hurt someone. The built-in battery also has a built-in plug, making it easier than ever to keep your taser properly charged. It even comes with a carrying holster in case you don’t want it in your pocket or purse. So if you want a zebra-striped or camo colored taser that really works, check out the Monster Stun Gun! If you want a free safety video to learn everything you need to know about your new stun gun, the Sabre Capacitor Stun Gun may be the one for you. The Sabre is incredibly painful, helping to incapacitate anyone or anything that comes for you. It comes with a very bright, 120-lumen flashlight. The safety switch and durable holster help to keep you safe and keep the stun gun from going off. The battery is simple to recharge. The taser is curved to help you keep your grip, making it a little more difficult for someone to take it from you. We love this stun gun and the company that made it for their dedication to safety and protection without compromise. We really love this stun gun, and we think you will too! The Guard Dog Stun Gun is safe, convenient, and powerful. It’s a great self-defense tool that can help to stop an attacker or animal in their tracks. But it also has both a safety cap and on/ off switch to help save you from accidentally discharging the stun gun. It’s super effective as a taser and as a flashlight too. It has a rubberized handle to help you keep your grip. The handle is round like a flashlight and is comfortable in your hand. The pink exterior and flashlight make this gun look harmless, giving you the edge of surprise. It comes with a nylon holster and a charging cord, which is everything you need to use the Guard Dog Stun Gun. 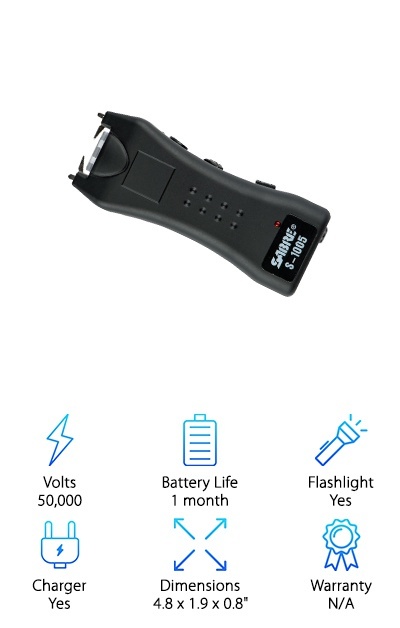 You don’t need to buy batteries for this stun gun! And the best part? It’s a great stun gun for a low price!